App design gets transformed like clockwork with evolving changes in different mobile platforms. UI design trends and advances with each OS update on iOS and Android platforms continue to bring world of changes for the app users. As far new design conventions and trends are concerned 2015 has been a really proactive year with several major design elements taking root. With 2016 knocking at the door, expectations are on rise for few new approaches in making design more user-optimized and engaging. 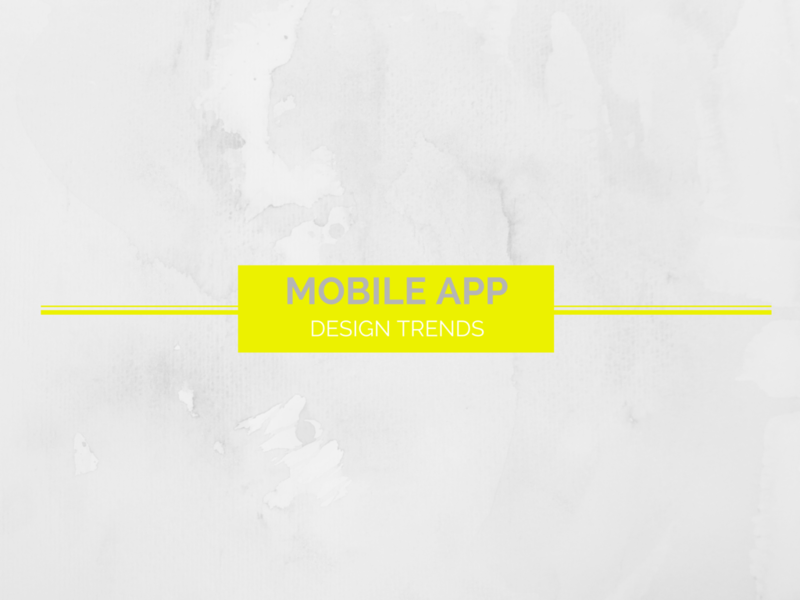 We would discuss here on mobile app design trends that are likely to make an impression in 2016. Animation heavy app design is the latest trend. Replacing the static app experience dynamic app with moving, ticking, trembling objects on app pages have become the mainstream norm now ad animation in this respect played a crucial role. Animation used contextually and proactively can make the interface and navigation elements more intuitive. Increasing number of apps are using animation as intuitive and guiding elements. Animations can enhance the visual appeal of the app and make it interesting. Used contextually and intuitively animation can enhance functional ease and user experience to a great extent. Animation offers easier suggestions for features, functions and contents. Animation facilitates more visual engagement and quirky elements to draw attention. Thinking of mobile app consisting of a series of single screen views is already a backdated approach as smooth visual transition in countless apps is already offering great visual treat and contextual focus in the app contents. In the years to come tis smooth and dynamic app view is going to have a bigger presence than it is now. With screen transition user is very unlikely to lose context while moving through an app. On the other hand, transition from one element to other with a single page a deeper sense of orientation can be created while navigating. Facebook’s Paper and Timeline page is a great example of this design. Flat design for last two years and so became a widespread phenomenon in both mobile and web in general. But, the pinnacle of flat UI is almost over as new design elements are continuously tweaking around the simplicity and ease of this design principle. Material design is a great example that perfectly blends this depth into otherwise flat UI offering more contextual ease. Though flat design is not altogether leaving the scene but it will continue to evolve by incorporating more object-like depth and natural feel. The simplicity and minimalistic approach of flat UI will still be popular but it will evolve with new elements. An object-like physical visual appeal will be more popular. By incorporating transparency and layers more depth will be created. Motion design is not a completely new thing as it has existed in visual media including movie intros, music videos and advertisements. Now as UI design advanced technologically, motion design now can be incorporated into mobile apps to create an impressive and attention grabbing visual experience for the user. In various ways the motion element in design can add fun and engagement. Just as you swipe over a list, a few images can offer a parallax or bouncing effect as you uphold your finger from them. Motion design can also be effective in intuitively guiding the user while navigating through your app. By incorporating motion you can add fun to your app user experience and enjoy more user footprint and conversion. Swiping sideways now became more popular for scrolling than vertical scrolling. Ease of navigation through pages is the principal factor behind the widespread use of this navigation. Moreover, as palm held using pattern of mobile devices makes it more convenient to scroll horizontally than downward, this design element continued to rise in popularity. Scrolling sideways is more user-friendly it allows more ergonomic control in navigation. Horizontal scrolling is perfect for popular design elements such as slideshows and storytelling. The beauty of typography has been unleashed by many apps and web interfaces these days. A change and variation in font size, a variation in font types and going a little weird with unconventional typography, all these and many more elements belong to the mastery of typography that has been incorporated into the digital world from print media. Now importance of typography in enhancing user experience is being felt more than ever. Re-mastering an old font with new elements has experienced good output. Android Lollipop and its re-mastered Roboto font is an example. Scalability of a particular font that does not deter the visual appeal is an important aspect. Finally, how the font type goes in conformity with the overall visual aspects is crucial consideration. The widely talked of principle, ‘less important’ is true in case of navigation as well. Navigation features fading in the backdrop or simply hidden navigation buttons that pop up contextually or sliding navigation menu that remain hidden in most part, make user experience better. Navigation buttons should not create the visual clutter on the screen. Navigation menu or buttons revealed just contextually with a swipe or touch allow simplifying UI so that users can concentrate on the content. Hiding controls while a media is playing or a slide show is running is a great example of hidden navigation features. Fading top bar while scrolling down is another example of this. Lastly, emphasis on app security is going to be a major area of concern as developers would be required to adhere to stringent security requirements in the coming years. App security corresponding to both data security and device access security is going to play a crucial role in the coming time. Keval Padia is a Founder & CEO of Nimblechapps. He is a iOS Game Developer, with acute knowledge of Mobile App Design and User Experience Design. His vision is to become the best mobile development company, which can transform people's idea into fully functional application at a very affordable price.